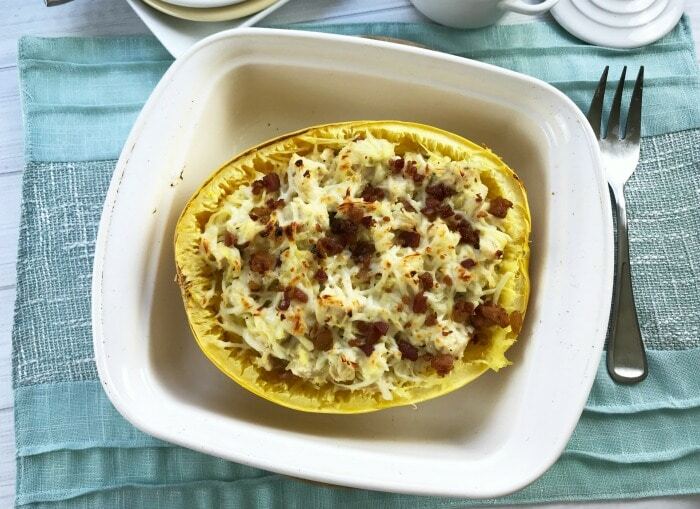 Looking for low carb spaghetti squash recipes? 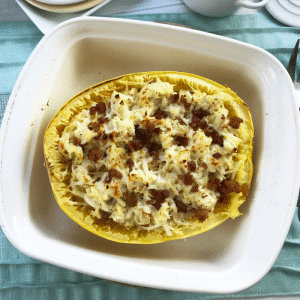 You have to try these Chicken Bacon Spaghetti Squash Boats! 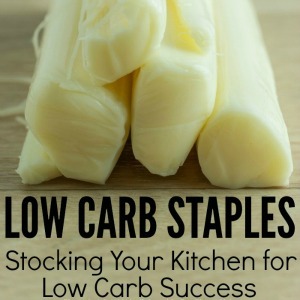 They have the texture and flavor of a pasta dish but without all those unneeded carbohydrates that will make you feel bloated after your meal. 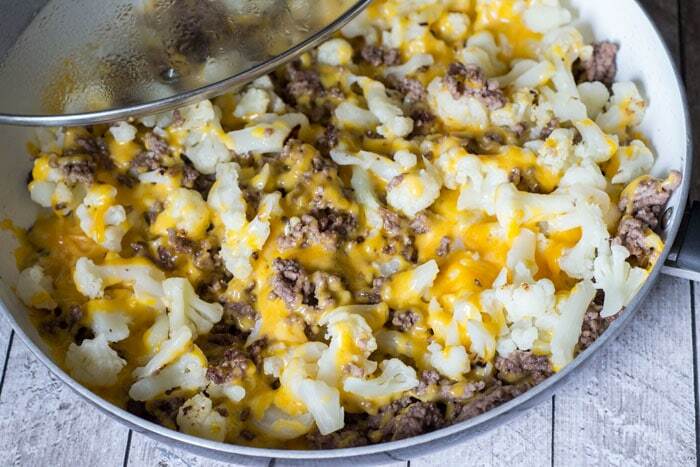 They’ll be your new favorite simple low carb meal. I prefer cooking spaghetti squash in the microwave, simply because I prefer not to heat up my oven if I’m just doing a simple marinara sauce or something like that on the spaghetti squash. But if you want to prepare more than one spaghetti squash half at once, use the oven. Pre-heat oven to 375 degrees. Cut spaghetti squash in half length-wise, and scoop seeds out. Brush the inside of each half with olive oil to help keep it from drying out. Place cut sides down on a baking sheet and place in the oven. Bake for 30 minutes. You don’t want the shell to be too soft for this recipe, since we’ll be stuffing them. Let cool for about 10-15 minutes. 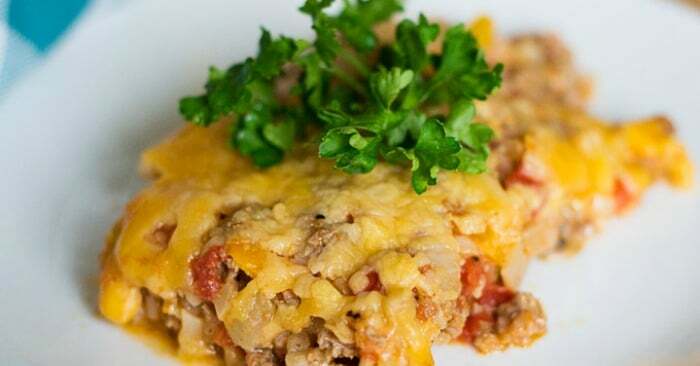 Scrape out the spaghetti squash, and follow the directions in the recipe below. Cut the spaghetti squash in half length-wise. Use a spoon to scoop the seeds out of each spaghetti squash half. Add 1″ of water to a microwave safe dish (I use an 8×8 Pyrex dish). Place one of the spaghetti squash halves cut side down in the dish. Place in the microwave and heat for 12-20 minutes, depending on the size of your squash. You want the spaghetti squash strands to come out easily, but you don’t want the shell to be too soft. For the diced chicken in this low carb spaghetti squash recipe, you can use rotisserie chicken or leftover cooked chicken. I like to cook chicken breasts in large batches in the slow cooker and shred them. This gives me lots of cooked chicken anytime I need it for soups, salads, casseroles and more. And bonus: cooked chicken freezes well. 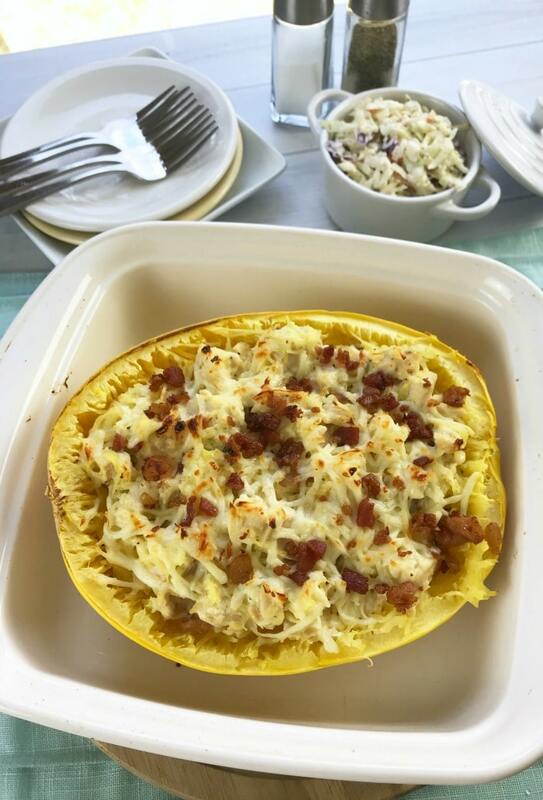 Satisfy your pasta craving without giving into a carb-laden meal with these Chicken Bacon Low Carb Spaghetti Squash Boats. They're loaded with chicken, bacon, cheese and sour cream, so you know it's good! Place the spaghetti squash cut side down in the dish. Place in the microwave and heat for 12-20 minutes, depending on the size of your squash. Let microwaved spaghetti squash cool for about 15 minutes before gently scraping the squash from the shell with a fork, being careful not to rip the shell. 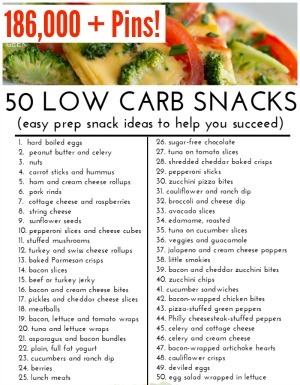 Remove from the oven and serve with a salad. Doesn’t that look delish? 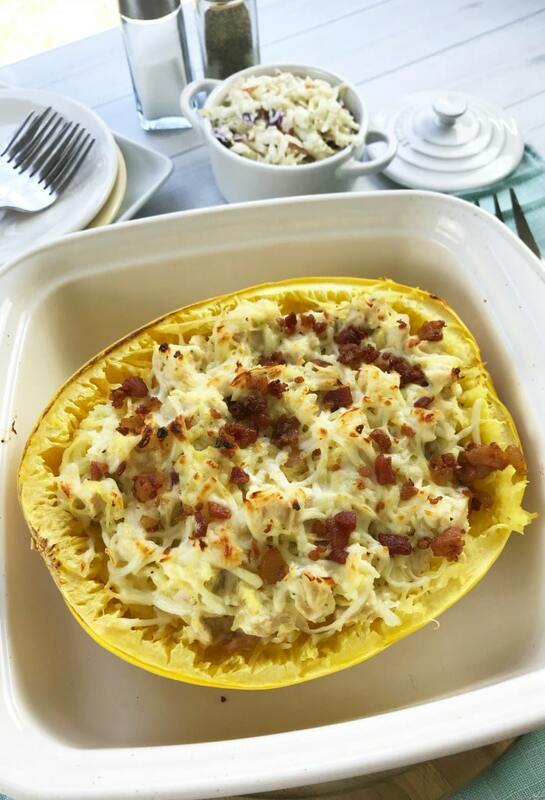 No guilt with this low carb spaghetti squash dish!